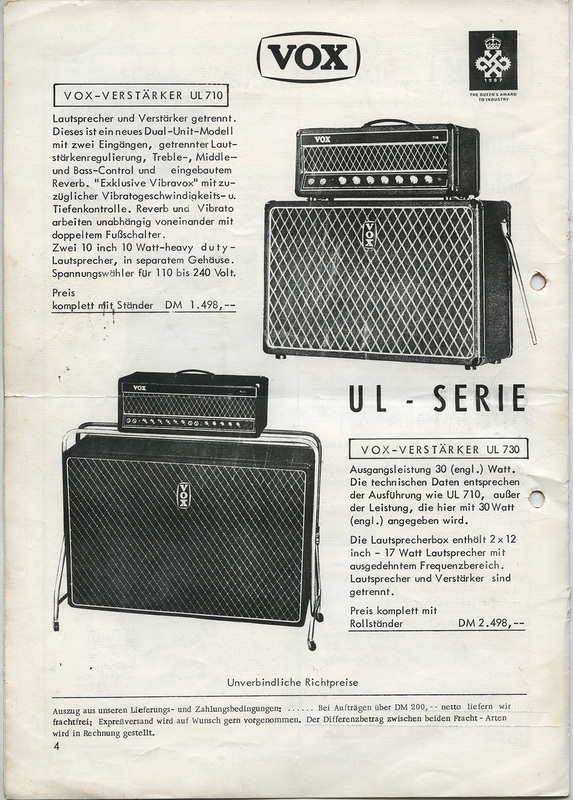 The advert reproduced in the previous post – from a German brochure of 1967/1968 – gives the price of the UL730 as 2,498 deutsche marks – equivalent to around £250 at the time, and about £4,000 in today’s money. To give some context to these figures, the AC50 Super Twin in the same brochure is priced at 2,628 deutsche marks = £260 at the time = around £4,300 today. Where direct comparisons can be made, German prices were generally 50% more than prices in the UK – ie. assuming there was one to buy, a UL730 would have cost around £170 in a London shop in mid ’67 – much the same as a Vox Conqueror. A page from a Vox brochure entitled “Standard-Programm Röhren-Verstärker” printed September 1967 (IX/67) for circulation in Germany in 1968 – note the presence of the “Queens Award for Industry” symbol. The award was granted to Vox in April ’67. Something must have gone slightly wrong at the laying-out stage. To the left of the entry for the UL730 is a picture of a UL7120 – single handle on box, and a penned in “7120” top right on the fascia of the amp. 2,498 deutsche marks – the price of the UL730 – was equivalent in 1968 to around £250, in today’s money £4,000 (according to the Bank of England inflation calculator). The power handling of the Celestion T1088s in the UL730 cab is said to be 17 watts apiece. This is also the figure given by Vox for the T1088s in Vox Conqueror cabs (the rating is given on a paper sticker inside the cabs). Page 3, which advertises the AC30 and the AC50 (Super Twin and Foundation Bass), is posted here. Vox 730 serial number 3089. Sold by “Piano Werner”, Straubing, an outlet that still exists. Further pictures posted here. Also to note in relation to the post on an AC50 and 760 cab below, a 715 – serial number 2040 – supplied by Servaas, The Hague. 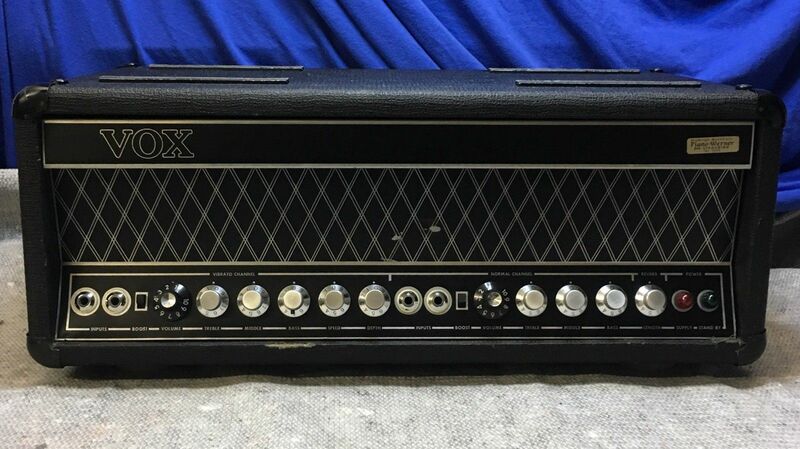 Other pictures of amp and cab are here. 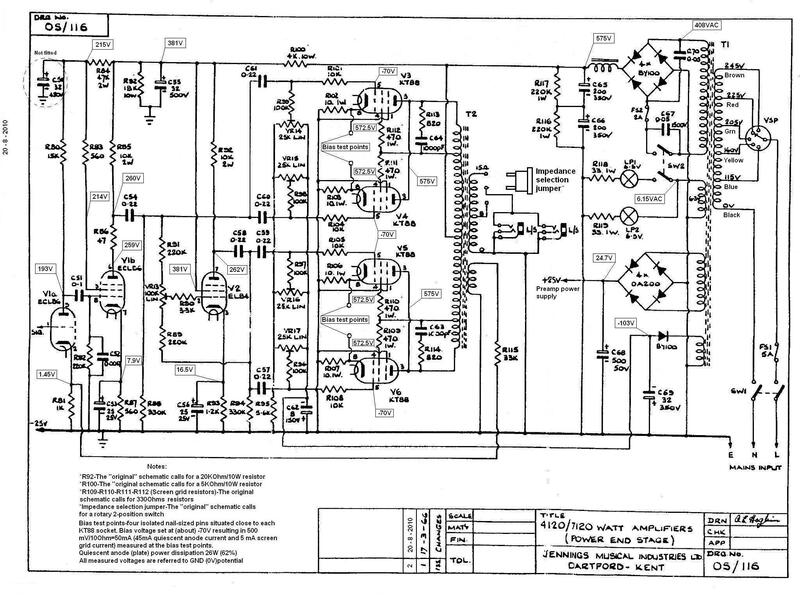 This schematic is closest to the actual build of the amps. For further comment, see the two posts below. Surviving 71os are registered on this page. Some more details on the 710, picking up from the immediately below. i) In the unnumbered schematic the 100K resistor that appears in all production amps, standing between the input sockets and the grid of the ECC83 that drives the reverb, is absent. It is however registered as R24 in schematic OS/112. ii) Conversely, OS/112 envisages two cathode capacitors – C9 and C15. These are not registered in the unnumbered schematic, and do not appear in the amps as built. Thanks again to Tuomo for the info. The dates and so on mentioned in the preamble need a little revising, but fine playing. Info on the 710 thanks to ‘Tuomo’. The earliest of the two schematics that have so far come to light (ie. the one without the number) seems to reflect best how the amps were actually built. OS/112, however, does register elements that were introduced as the production of the various batches proceeded – resistor R36, for instance, in the reverb circuit -not found in serial number 1005 (registered here), but present in serial number 1036. The dates of apparently new elements noted on the later schematics must be treated with caution though. 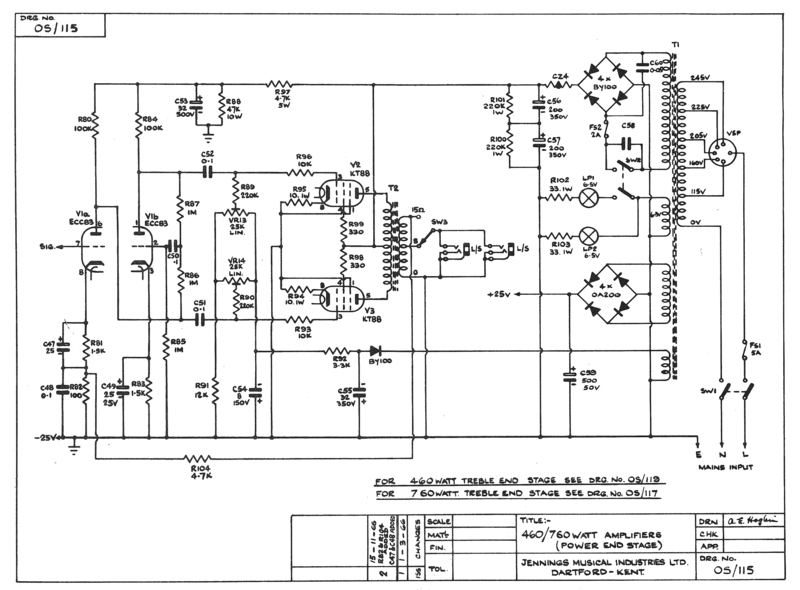 The schematics are not designs for amps. They were mostly drawn up well after the event. Triumph built amps in short runs, introducing changes along the way. It is always best is to take the amps themselves as the primary starting point. The schematics may be perfect for one, but not for another. Differences are simply differences. There is no mystery, no conspiracy, no *desire* to misrepresent reality. As mentioned, for the 710, the unnumbered schematic is the closest to the batches of amps that Triumph actually built. The vibrato circuit is OFF until switched on via the footswitch. However, a good number of amps have a jumper across pins 4 and 5 of the DIN socket, which ensures that the vibrato is always on (ie. cannot be switched off by the footswitch). “Left one is from un-numbered schematic and presents the actual built circuits in all amps which I have seen (my own and looking at the pictures in your pages) and the right one is from OS/112. Info thanks to Steve Walsh. Going by serial number 1004, early 760s do not have the negative feedback circuit that is noted as an addition on OS/115 (power section). Again, do not take the date on this schematic as indisputable fact. The change was evidently brought in during the course of production. Pictures show that serial numbers 1041 and 1063 – pictured on this page – incorporate the feedback circuit, a purple wire running from the board adjoining the ECC83 valve socket and tying off on the 15ohm terminal of the impedance selector. When info on datable components of these amps comes in it may be possible to judge better when Triumph made the change. Serial number 1004 has other early features too – these will be noted soon. 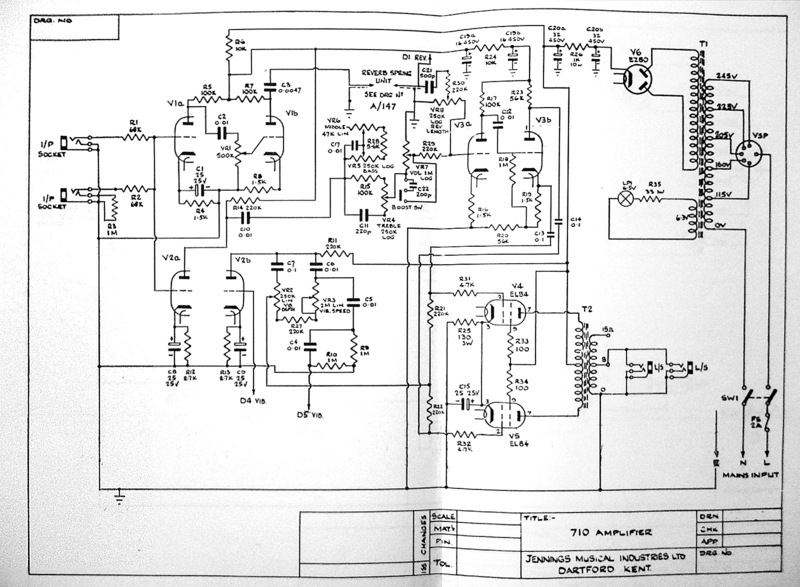 The schematic for the power section of the 460/760 – OS/115 – is given below; so the schematic for the 7-series treble preamp – OS/117. An old picture, but perfectly legible. The cab denuded of its front covering (scrim and grille cloth); the metal badge originally fixed by Servaas to the cloth transferred to the baffle. Servaas was an important outlet for Vox up to c. 1968. For conventional AC50 and AC100 sets with Servaas badges, see this page, entry for 3rd Dec. At least one other pairing of an AC50 with a UL760 cab in Holland is recorded. 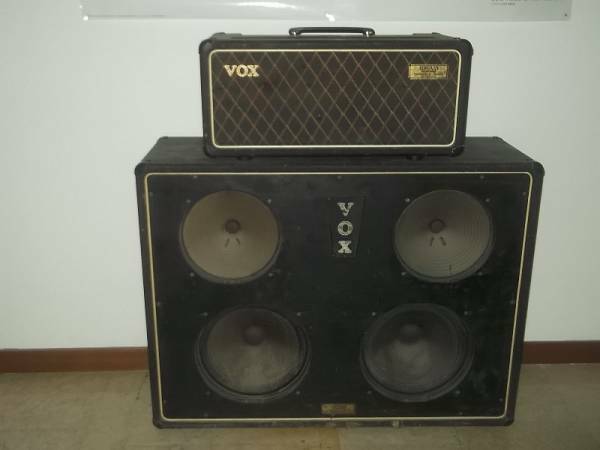 Fully solid state Vox amps with Servaas badges have yet to come to light – it is possible that the shop sold that new range, but nothing definitive so far. Whether the cab above came to the shop without a 760 amp is unknown. 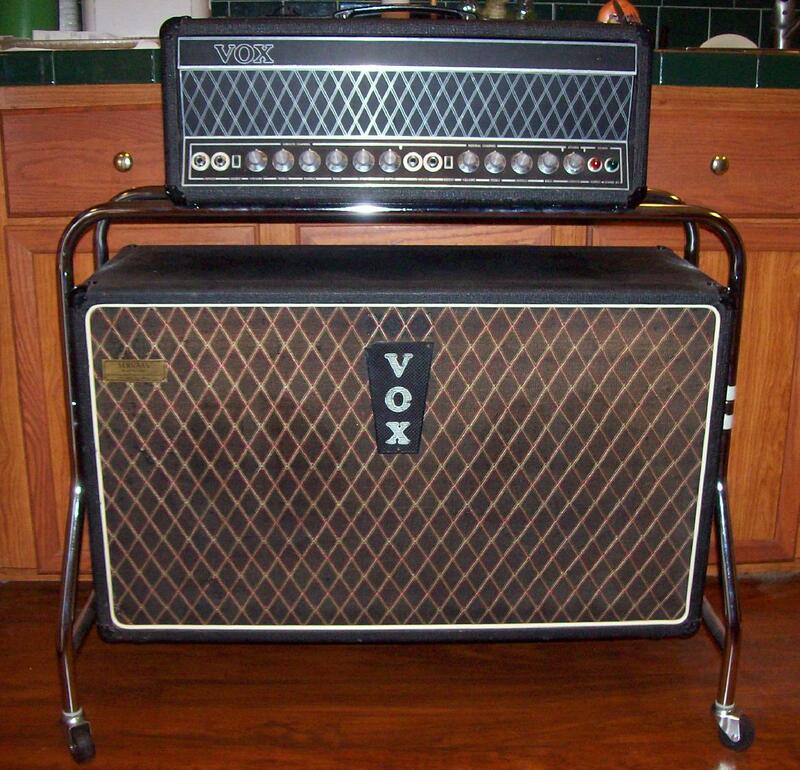 When Vox decided to wrap up the 4 and 7-series range of amps, other uses for the cabs were found – so again, perfectly possible. Worked up in 2010. It is not known at present which amp was tested and measured. 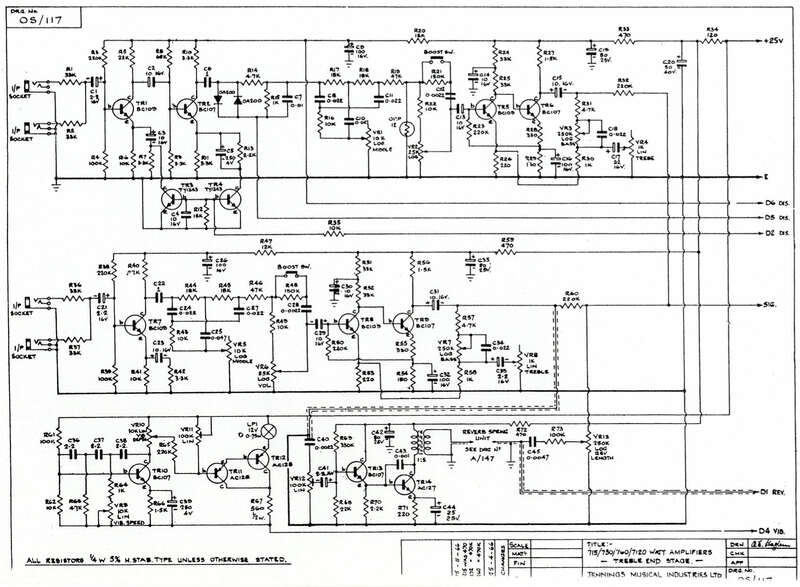 Note that the sheet has been digitally altered to accord with the build of the amp – it is stated that in the original schematic prepared by JMI, R92 is 20K ohms/10W; R100 is 5K ohms/10W; and R109-R112 are 330ohms. See below, this is not entirely correct. Beware of the bias voltage mentioned – this could be too low for modern valves. It should also be said that plate voltages may differ from amp to amp. Above, a detail from OS/116, unmodified. Click for a larger much sharper image. R92 is not 20K ohms/10W as the tester noted on the modified sheet, but 10K, which is the value he encountered in the amp in front of him.